Last edited by victorsra on Thu, 08 Nov 2018, 14:57, edited 3 times in total. Looking forward to this one. Maori will win of course but hoping Brazil put up a fight. Is this time for real? I don't remember anymore: has he played for Brazil at least once in the past or he just ended to remain in Italy every time they called him? Last edited by Canalina on Thu, 08 Nov 2018, 04:13, edited 1 time in total. thatrugbyguy wrote: Looking forward to this one. Maori will win of course but hoping Brazil put up a fight. Most interesting fixture of November for me. I think Brazil will come out fired up and keep it close for 20 minutes or so. Yep, he's with the team already. He was called to a Brazil vs Kenya match but did not played AFAIR. Have you watched him playing for Reggio? Rumours that the attendance might reach 40.000! Well... hard for any Brazilian player! Last weekend's Soldier Field triple-header had 35.000 people... We may reach 40k! Why are the in goals so small? There's clearly enough room for the full 10m. Other than that the field looks in good condition. Weather forecast says chance of thunderstorms in the afternoon but should clear up by evening. As for the crowd, it's already a record one way or another, but to get even close to 40,000 would be amazing. Historic day for Brazilian rugby. Hopefully we see a similar turnout in Chile next week. I guess the problem is the opposito in-goal, that is too close to an area without grass. I think Chile's stadium is only about 20.000 seats. I don't want to spoil the fun of Brazilian fans and I'm happy for them but this match shouldn't have happen as things looks in world of rugby. Visiting two tier 3 sides only for money is a shame and OK, not Romania to not call me subjective, but at least Georgia should have been visited by Maoris until now. This event speaks volumes about the way tests are awarded, about the nepotism and business interest of Pichot and it's a shame rugby establishment. Who said they won't go to Eastern Europe soon? It would be pretty logical. However I do agree with you that Pichot does more for the Americas than any other continent and this must be questioned. But I am not sure how much Pichot influence is in this MAB tour. The unions in Europe probably need to push things a little harder. I agree the Maori would be well suited for matches against REC nations, but I think they’d need to present something to the NZRU united. November (or even July)matches against Romania, Georgia and Russia would be a good proposal, it would just be a matter of presenting an excellent case for the tour. Last edited by thatrugbyguy on Fri, 09 Nov 2018, 12:46, edited 1 time in total. I agree with AMZ that Georgia and Romania should have had them way earlier. But I think Brazil, Chile and the USA years before, help to create cases that it makes sense for them to visit t2+t3-opposition. The Maoris are probably the only 2nd team to draw a reasonable crowd in tier2+3 nations. Good that they can make money, kind of strange that this team wasn't used before that much to grow rugby. Everybody knows the Haka, that's probably rugby's most influent and most valued folklore. Hopefully they are a success, because if they are this will lead to them touring t2+t3 more often (and then hopefully also to Romania and Georgia). thatrugbyguy wrote: The unions in Europe probably need to push things a little harder. I agree the Maori would be well suited for matches against REC nations, but I think they’d need to present something to the NZRU united. November matches against Romania, Georgia and Russia would be a good proposal, it would just be a matter of presenting an excellent case for the tour. What Europe needs is somebody actually speaking for them with a strong voice. I don't blame Pichot. He is doing a very good job in growing the game in the Americas. Naturally he favours where he comes from. That's absolutely okay in my honest opinion. If "European" Rugby World guys would think the same way since the game went pro, we would have a competitive 12 team Euro by now + a way more money generating 24-team RWC. RugbyLiebe wrote: I agree with AMZ that Georgia and Romania should have had them way earlier. But I think Brazil, Chile and the USA years before, help to create cases that it makes sense for them to visit t2+t3-opposition. That’s another thing to consider. The Māori for most of their history have played most of their matches against Pacific Island nations, they’ve really only played a handful of times in anywhere else. This South American tour is already a success, meaning there’s value in the Māori brand. If they see this works in South America where rugby’s presence isn’t massive the there’s a good argument in favour of tours to Europe against REC teams in the future. Keep this in mind. This America’s tour is the longest Māori tour in 15 years. They play a lot of one off matches, they haven’t played many 3-match tours before. I don’t disagree. Europe needs a stronger voice for the REC/RET nations. Pichot has been passionate about growing rugby in the Americas for years now and he should not be faulted for that. Europe needs its own voice. Good, Rugby Europe has a new CEO. Bad, Rugby Europe has another Frenchman leading as if the very same receipt would work this time differently. thatrugbyguy wrote: Pichot has been passionate about growing rugby in the Americas for years now and he should not be faulted for that. Europe needs its own voice. I certainly think a Eastern European tour has merit for the Maori. If you look at the history the last time they played a European team in Europe was 1988, they have tended to stay closer to home and play Pacific rim nations. In fact they've only played November games the last few years with the majority of games before this being during the June window. I think its more likely that they take on Hong Kong or South Korea in a tour, and build on their success in Japan. Maybe during the November internationals Georgia and Romania are more focused on playing national teams rather than a 2nd XV. 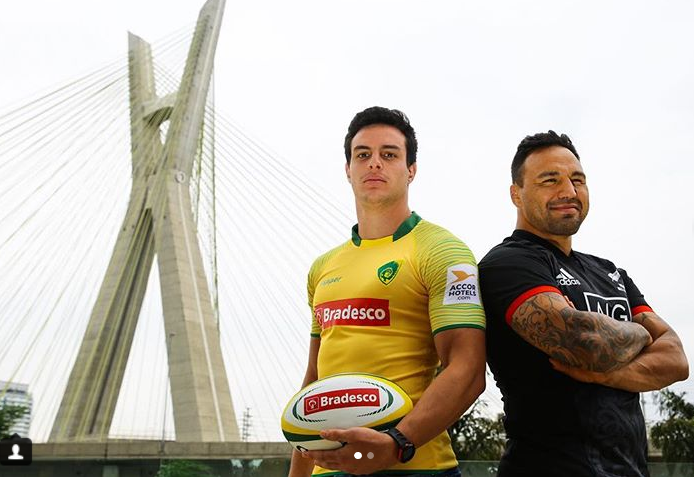 From what I understand this Maori tour to South America happened due to Canada not qualifying for the RWC, and I'm not sure if Pichot had any direct role in it, but someone must have because no one here knows about Brazil or Chile rugby. I suppose one could argue they're taking care of their hemisphere. Even if this was due to a Canada tour of two matches there's still no excuse why a falling side is kept feed with Maori games while Europe is totally ignored.